Ideal wheelchair posture enforces neutral body alignment. The head is balanced over the spine, and the spine is balanced over the pelvis. The shoulders should align slightly behind the pelvis. Poor positioning causes skin irritation, loss of mobility, and breathing difficulties. Occupational therapists perform wheelchair assessments for each individual’s unique ability and needs. A comfortable wheelchair position is vital for health and productivity. Wheelchair pelvic tilt is evaluated as forward tilt (anterior), backward tilt (posterior), slant (obliquity), or rotation. The pelvis is the key to proper wheelchair body positioning. Many physical conditions cause an uneven pelvis, but proper ergonomic assessment distributes pressure and prevents muscle contracture. Tight hamstrings, self positioning, and an inability to maintain 90 degree hip to leg angles causes posterior tendencies. Weak stomach muscles, weak hamstrings and tight hip muscles promote anterior tilt. Muscle imbalance, muscle contracture and incorrect wheelchair size contributes to pelvic rotation and obliquity. After an occupational therapist evaluates a wheelchair user’s needs and medical condition, correct pelvic positioning will correct flexible deformities, accommodate fixed deformities and minimize postural supports. One of the accessories used for proper pelvic positioning is a wheelchair belt. Both forward and backward pelvic tilt can be corrected to a certain extent with a properly positioned belt. Two point, four point, or harness belts assist positioning. A person’s spine should maintain a natural S-curve alignment. The shoulders should be above the hips and ears above the shoulders. A good starting point begins with a wheelchair’s backrest angle as close to 90 degrees from the floor as possible. As the backrest is moved just below the mid-body spinal curve, it should contact the lower curve, or lumbar spine. Beginner users may need a higher backrest and larger backrest angle, which can be changed as their body strengthens. Body pressure should be divided between the seat and the backrest. Pressure should not be higher in one location more than the other. The larger the contact area, the less likely pressure sores will form. The user should sit as far into the seat as possible. Occupational therapists palpate pressure in all body-to-chair contact areas as proper assessment procedure. Padded backrests and lap trays provide extra reinforcement to keep users comfortable throughout the day. Extra arm cushioning elevates arms to keep shoulders at comfortable levels. The ideal posture for the lower body involves both the legs and feet. Feet need to be flat on foot supports in a neutral position with ankles at 90 degrees. Foot supports need to be at least two inches from the floor. The thighs need to be parallel to the wheelchair seat with knees bent just over 90 degrees, with one to two inches of space between the back of the knee and the front of the seat. Foot and leg positioning directly affects the position of the pelvis. Improper footrest leg height increases pressures on other body areas. 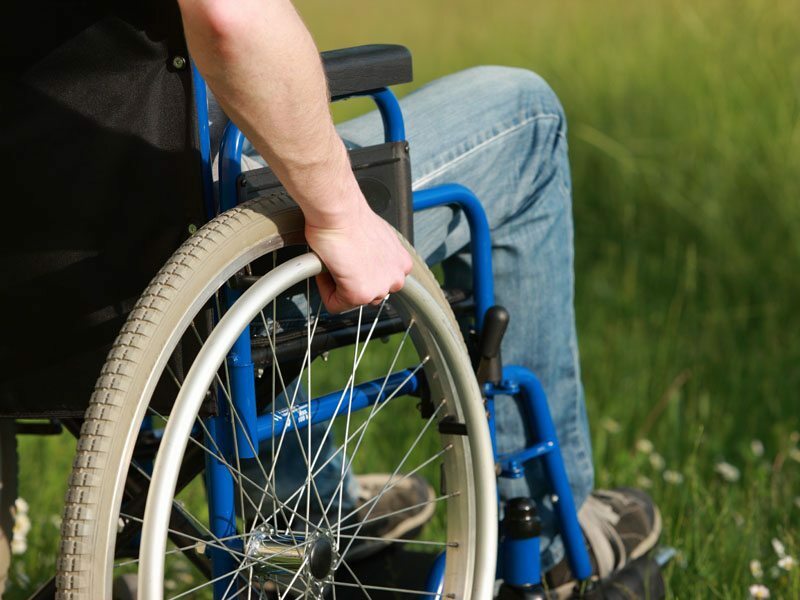 Poor posture causes pain and deformities in wheelchair users. Improper body positioning causes flexed muscles to shorten, thus reducing a person’s usability. Back and shoulder pain do not need to be an inevitable consequence of wheelchair users. Complete skeletal assessment, followed by postural changes, can alleviate typical musculoskeletal pain, and allow functional stability. How to sit at your computer desk?